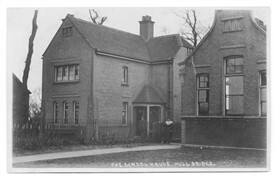 A postcard picture of the Hullbridge Council School taken c1911. Shows the school as it was when opened in 1902 with entrance to the side. The house next door is that of the school master. The land preceding the school had not yet been developed. The reverse side of this postcard sent 16th Oct 1911 by Mr Best school master, to a Mrs M Crampton in Grimsby. "My Dear M. I thought you would like a photograph of our school and house. This is the first I think that has been taken. The photographer has been down to the river to take the children as they are being rowed across. When they come I must send you one. Should like to have a line from you so do write soon. Kindest regards to Mr C and love to your self. 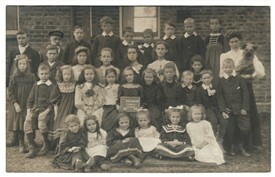 Yours T."
The second picture is the staff and children in 1908. They appear to be assembled at the rear of the building. The man at the back on left wearing a peak cap appears to be Thomas Best school master. 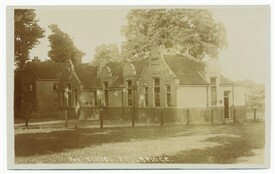 The third picture c1907 is of School house. The school master believed to be Mr Thomas Best, standing in the porch way of his house and nearby an unknown woman standing by the school boundary.